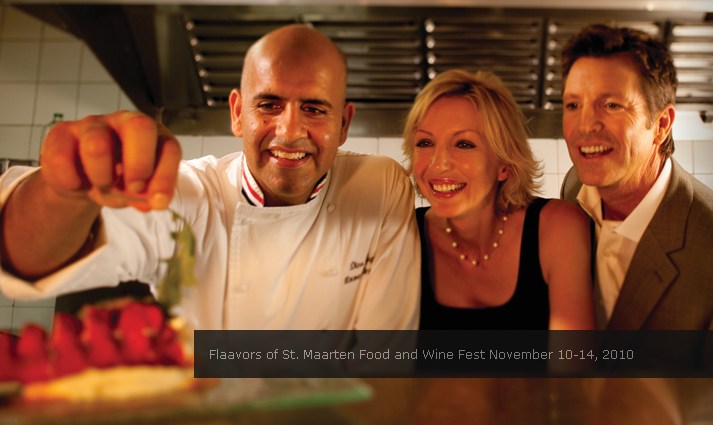 (Nov 1, 2010) – St. Maarten, long-known for its culinary diversity, is launching the first “Flaavors of St. Maarten Food & Wine Festival” (www.Flaavors.com) to take place Nov. 10 – 14, 2010. The “Flaavors of St. Maarten” event will offer five days of cooking, wine pairing, instruction and culinary excitement for food lovers from around the world. Demonstrations and specific events will take place at various hotels and restaurants on St. Maarten and will be announced in the coming weeks. “Flaavors of St. Maarten” will bring together the island’s top chefs with celebrity chefs from around the world. Participants will be able to experience intimate winemaker dinners, a Grand Champagne Tasting, and formal sit-down celebration dinners. On the final day of the event, visitors and locals alike will be able to enjoy festivities while sampling hundreds of different types of foods and wines along the Philipsburg beachfront and boardwalk. Participants will be delighted by the food of great chefs and the sublime wines of the best vineyards from around the world. Additionally, those who attend will have the opportunity to learn how to cook from master chefs, the correct way to taste great wines, and experience what it takes to achieve culinary greatness. Participation by 40 of the top restaurants and wine distributors in St. Maarten as well as the Napa Valley Vintners Association, among others. Accommodations on the island are abundant as St. Maarten offers a wide range of places in which to stay, from luxurious secluded villas providing complete privacy, to small cottages and townhouses, to full-service luxury suite hotels and spas offering every amenity. For accommodations information, log-on to www.VacationStMaarten.com. For event ticket pricing and additional information about the first “Flaavors of St. Maarten Food & Wine Festival,” visit www.Flaavors.com.